‘The Secret Campsite is a peaceful, tents only campsite for nature lovers, real campers and their families, who are looking to explore Sussex, Brighton or Lewes. Our woodland meadow camping pitches are large and secluded and come with their own camp fire pit and free hot showers.’ This place looks pretty special, a prime example of unexpected Sussex loveliness. At this campsite you also have the opportunity to try out an amazing tree tent, you may have seen it on ‘George Clarke’s Amazing Spaces’ on Channel 4. As this site does not allow campervans I may be forced to try out one of their ‘Secret Shelters’, one of which is a Tree Tent. It looks so cozy! ‘At Little Dernwood Farm we have one of the largest blocks of coppice woodland in East Sussex. They are formally identified as semi-natural ancient woodland being the vestige of the dark and forbidding forest that covered The Weald in ancient time, and the camping field is set within the very heart of these 70 acres of woodland.’ Brilliant! Woodland camping plus the added attraction of a functioning traditional farm selling high quality products to cook over your campfire. Car free, so no campervans again, but the opportunity to hire bell tents and safari tents. Aiming to be real ‘Wild Camping’ so no showers, although you can borrow a solar shower bag – intriguing! ‘The Campsite has a maximum of 20 tents and the camping pitches are in cosy little private woodland glades’. Blackberry Wood is possibly the original ‘wild camping’ campsite in Sussex. It was featured in the Guardian a few years ago and since it has been very popular, in fact people often book a year in advance. One has to assume they do what they do very well. 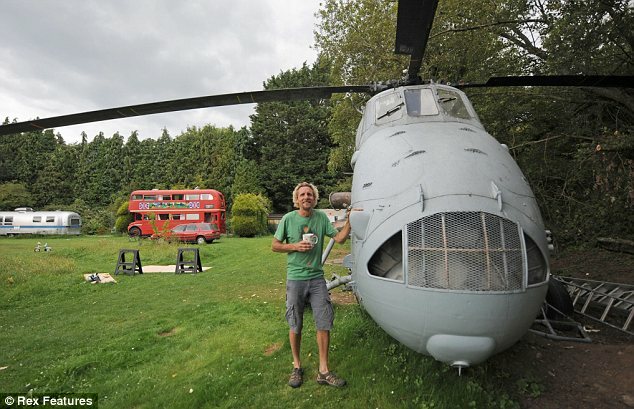 They have now added a gypsy caravan, a london bus, a wooden lodge and a helicopter (yes, I said helicopter!) to their accommodation options. Sadly no campervans again – I am detecting a pattern here! Located very close to the well known campsite WoWo, close to the Bluebell railway and the Ashdown Forest (home of Pooh Bear! ), Kitts Cottage offers woodland camping, views, campfires and a great family friendly eco-camping vibe.’The camping ground is set in and around a natural glade – a forest clearing if you like, although in this case the open area that surrounds the site runs to nearly 20 acres. Pitches are set both in the glade itself or along the outside of its circular edge.’ And hurrah, they accept campervans! In Kent this time, not far from Tunbridge Wells, Forgewood has all the right ingredients – woodland, campfires and a laid back feel. It is situated on the Eridge Estate, a large estate originally created by William the Conqueror, the campsite itself covers a large area. I visited the Eridge Estate last year for a festival and I can vouch for it being a beautiful location and though I have never visited Forgewood myself it has often been recommended by friends. Another Kent campsite, love it for it’s name alone! The campsite is part of a fruit and vegetable supply business – the type that offers those weekly veg boxes, so you can get yourself some good quality produce to enjoy at the campsite. It seems to be a lovely spot for nature watching and has some stocked ponds, great for fishing, pond dipping and paddling. 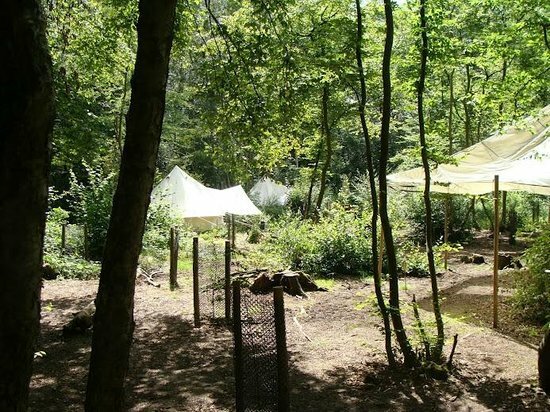 UK campsite reviews are positively glowing and The Independent says ‘Nethergong Nurseries is the perfect kids’ playground: full of secret paths that promise adventure, and nooks and crannies in which to hide‘. Very tempting! Kent and Sussex are literally thick with great camspites! Sadly for me many of them do not accept campervans. Campervan prejudice – so unfair. Oh well, I guess I’ll just have to rent a helicopter! How could I have missed these very beautiful looking campsites! And they accept campervans by arrangement. Hurrah! I have not included all the campsites I have come across because, well, I am supposed to have a life away from researching campsites but I have to say the area provides a rich seam! Thanks Aly, Britain is fabulous isn’t it – so varied!